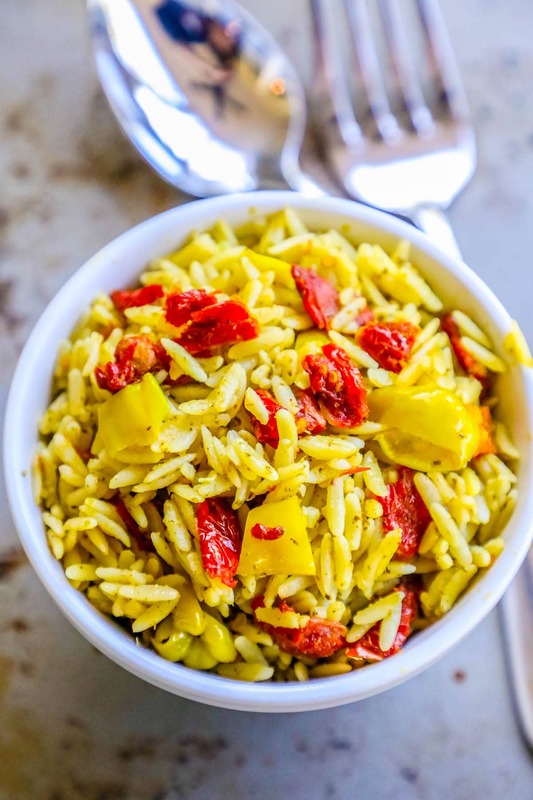 Easy one pot Orzo With Sun Dried Tomatoes and Basil Pesto is a light vegan side dish everyone loves – slightly spicy, a little salty, and packed with sun dried tomato and pesto flavor in a quick pasta salad that is perfect for picnics, parties, or alongside fish, steak, chicken, or pork. 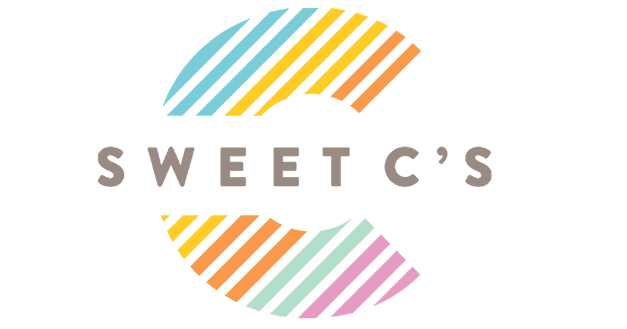 I love pasta salads – they are easy, quick, delicious, and full of flavor – but also perfectly portable, great hot or cold, and can work as a side dish, mixed into a salad, or even a complete meal when served bowl-style with grilled vegetables, chicken, fish, steak, or pork! While I love to make pasta salad, I really really love to make orzo pasta salads – the shape of the orzo is fun and easy to serve, and orzo cooks so quickly it’s great for a super-quick dish everyone loves! 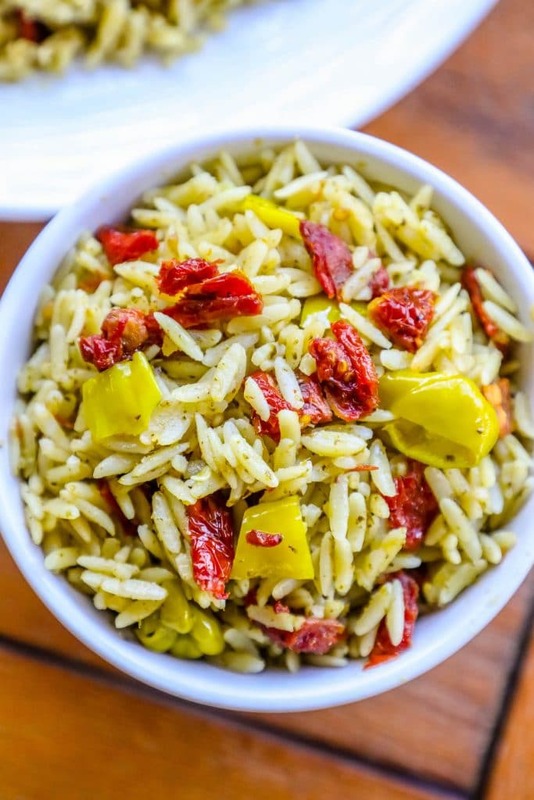 Just take me to the Orzo With Sun Dried Tomatoes and Basil Pesto ever already! 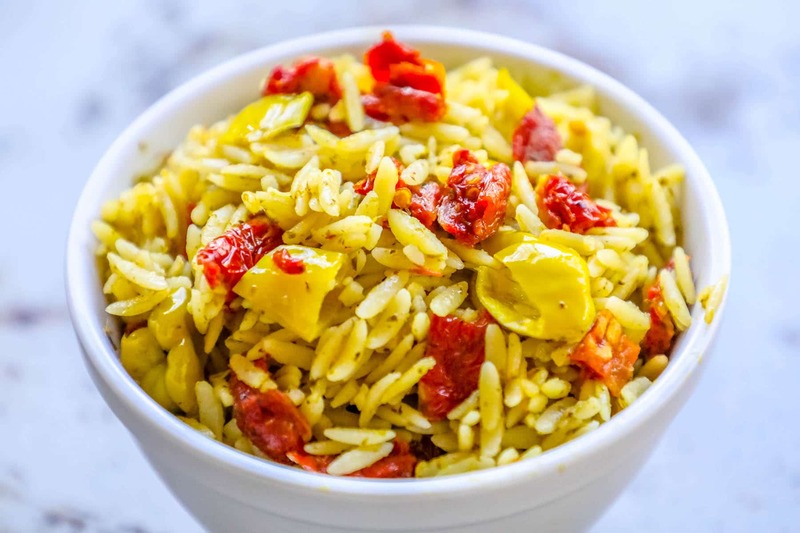 If you’d rather skip my (very helpful, i think) tips and tricks and get straight to this deliciously easy Orzo With Sun Dried Tomatoes and Basil Pesto Recipe – simply scroll to the bottom of the page where you can find the printable recipe card. This easy one pot Orzo With Sun Dried Tomatoes and Basil Pesto is full of my favorite flavors – bright and salty pesto, tangy pepperoncinis, and tart sun dried tomatoes. It is totally crave-worthy and takes less than 10 minutes to make – just boil the pasta, toss, and serve! Pasta salad is perfect in summer for a delicious, easy, and portable dish – and this orzo pasta salad is made without mayonnaise so it is great to sere at picnics and potlucks without having to worry about keeping it an exact temperature. There are a couple of tips and tricks to make this orzo pasta salad perfect for serving later without stressing too much – these tips will make your orzo pasta salad perfect every time! 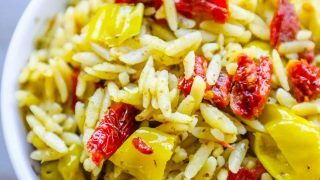 This pasta salad is mixed with oil and antipasti, so it is best to cook your orzo with just a tiny bit of crunch so that it doesn’t turn soggy when mixed with the antipasti and oil. Let orzo chill before mixing antipasti. To help keep the flavor perfect, let the orzo chill slightly before mixing with antipasti and oil. Refrigerate up to a day before serving. This pasta salad actually tastes best chilled – so refrigerate before serving. This pasta salad is perfect for potlucks and picnics – because it can be made up to a day in advance and kept in an airtight container int he refrigerator before serving. Keep cool – but don’t stress the temp. For food safety, you should keep this pasta salad chilled – but because there is no egg or mayonnaise, you don’t need to stress too much if it’s not over ice the whole time. This easy and delicious side dish is perfect for picnics, potlucks, impromptu dinner parties, and great for meal prep for busy weeks – add grilled chicken, steak, or pork for a delicious meaty pasta that is great even cold for a filling and hearty meal on the go! 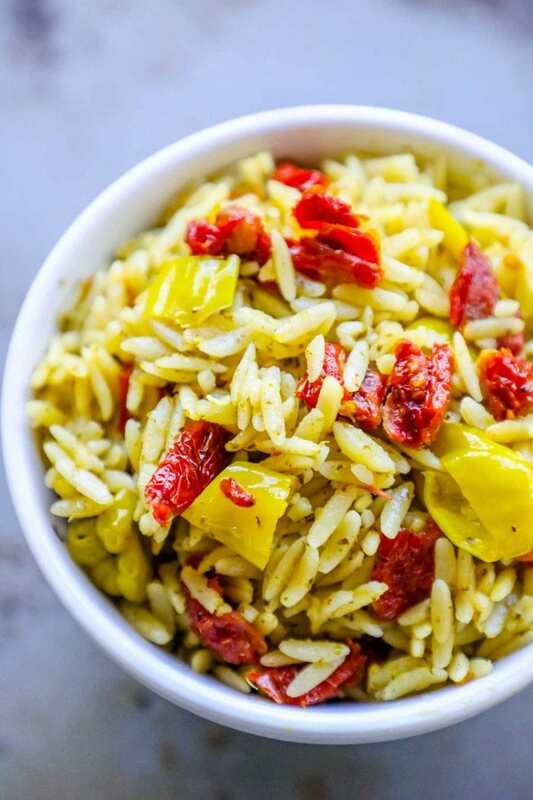 Easy one pot Orzo With Sun Dried Tomatoes and Basil Pesto is a light vegan side dish everyone loves - slightly spicy, a little salty, and packed with sun dried tomato and pesto flavor in a quick pasta salad that is perfect for picnics, parties, or alongside fish, steak, chicken, or pork. In a large pot, boil 4 cups water. Add orzo and boil pasta to al dente. In a large bowl, add orzo and the rest of the ingredients and stir, tossing to be sure it coats the pasta evenly. Refrigerate for 2 hours to overnight. Serve with chicken, fish, steak, or mix into a salad for a delicious pasta salad! Previous Post: « Visiting Sanibel Island Florida – Why to Pick Sanibel for a Beach Getaway!